Dec 31, 2015 Copper King and Desert Star Bob Moriarty 321gold .. In April of 2014, an eternity ago in resource years, I went to Arizona to visit some copper projects. I wrote about it. Copper was about $3.15 a pound. Lately the price of copper has dropped as low as $2.06 a pound. The projects I saw were impressive and I said so. Curis Resources was sold soon after at a 25% premium. The other company I visited has dropped in price but not nearly as much as you would suspect, going from $.215 then to $.14 today. That would be Desert Star. There are a few commodities that are not going to recover in the next 30 years, coal and iron being among them. Giant companies that expanded to meet the immense demand from China as China moved from an agrarian society to a consumer society dominate those commodities. Once they had paid off their initial capex expenses, the price they needed to get for the commodity dropped. Iron could go as low as $25 a ton and coal $30 a ton before starting to recover. Copper on the other hand is consumed as it is mined. While copper has gone down in price it hasn’t gone down the same way iron and coal went down and it will recover sooner as major mines close over the coming years. Desert Star (DSR-V) wasn’t hurt from the price of copper nearly as much as they were by permitting delays. They filed for drill programs on their Copper King and Red Top projects in February of 2014. Actually the people taken on the tour I attended in April of 2014 were pretty much expecting to see some action on the drill permits long before now. Those sorts of delays are killing junior mining companies because their day-to-day expenses continue without the possibility of any good news. But finally, almost two years later, Desert Star has those permits in hand and in an announcement made on the 29th of December said that they would begin a 2100-meter drill program around the 15th of January 2016. This is welcome news to long suffering Desert Star shareholders and the shares responded with a 40% rally in one day. In reality, the announcement was nothing more than a liquidity event for shareholders as the shares have barely averaged 20,000 shares a day for many months. I’ve been on the ground on both major projects Desert Star is working one. The company is hunting in elephant country as the chart below shows. Few Americans realize it but Arizona produces over 60% of all the copper mined in the US. The Globe-Miami district has more than ten active or past producing copper mines. The first project to be drilled in 2016 will be the Copper King project. Copper King is a mere 5km from the high-grade Resolution Mine. Desert Star plans a 2100-meter program. Drilling will start mid-January and complete 3-4 weeks later. Add 2-3 weeks for drill results and the company should be releasing numbers around the 1st of March. 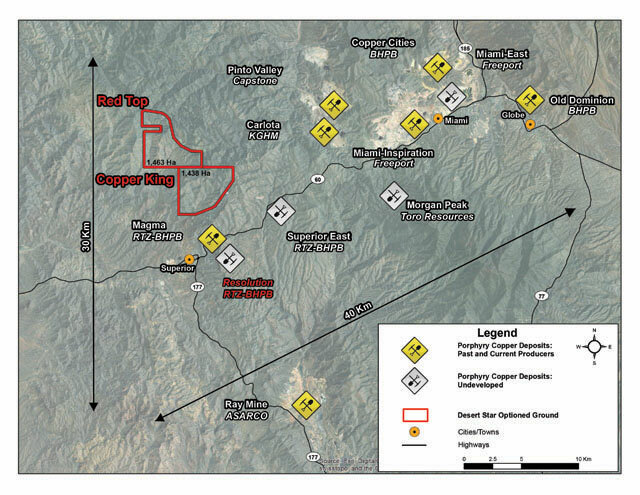 Desert Star entered into an option agreement to earn 100% in September of 2013 that calls for them to spend $5 million in exploration over a 7 year period, to issue 350,000 shares and to make an advance payment equal to 380,000 pounds of copper to be applied against a 2% NSR. 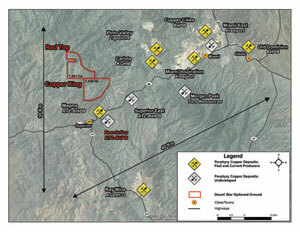 Copper King is an obvious big copper target based on geophysics and technical studies. While obviously the company understands the market wants to see high grade and long intercepts, it looks like an elephant in an area that looks like a stomping ground for elephants. Desert Star hopes to have drill permits in hand as they complete the Copper King program so they can move smoothly to drill the Red Top project nearby. The terms of the 100% option are similar to that of the Copper King agreement. The 2nd drill program will be shorter, some 1600 meters and results should be announced around the 1st of April. Mapping of Red Top shows a 350-meter by 250-meter area of intense alteration known as a lithocap. Company geos believe they have the roof of a porphyry copper system similar to that of the Resolution Mine just 8 km south. The Resolution Mine has a resource of 1.7 billion tonnes at 1.53% copper. A few holes will prove or disprove the concept. Obviously raising money has been a giant issue for junior mining companies during the drought that has lasted nearly five years now. Juniors are shriveling up and falling off the vine by the drove. Desert Star was smart enough to cash up over the past 18 months and is positioned to do enough of a drill program to test high-potential targets. A year ago the company extended 8.2 million warrants at $.15 that expire on February 25th, 2016. To the extent that those warrant holders will be looking to sell shares and exercise warrants into expiration, the price of DSR will tend to be capped. Obviously management would like to see those warrants in the money so they will do everything in their power to release good news as early as possible but the overhang will provide punters with a cheap call on copper through the beginning of March. The company has a market cap of about $6 million in USD today. A big hit on either project would bounce this stock like a basketball. Desert Star was an advertiser going back to May of 2014. When May of 2015 rolled around they told us they just couldn’t afford to continue to advertise until they could either show drill results or the general resource market came back to life. I told management that we would carry them at no cost. My OPINION is that they are the cheapest call on copper in the market. I’ve had my feet on the ground on both projects. I think their drill program will meet with great success. I participated in a PP in 2014 and have yet to sell a share. Desert Star is not a paid advertiser. You reap the benefits or costs of your investment decisions so must take responsibility for them. Please do your own due diligence.